Each Aegis Living community is a tight-knit family of residents where seniors with Alzheimer’s can meet and make lasting relationships with others moving along the same path in life. It leads to a warm and welcoming environment built on compassion, care and mutual comforting. However, residents are also ingrained in the communities outside and want to continue to make positive impact in their neighborhoods with volunteer and non-profit work. After all, many seniors belong to Aegis Living communities within their hometowns and remain close to their friends and family members throughout their golden years. One extraordinary and touching story of giving back to the community takes place at Aegis of Aptos, California. As marketing director Jennifer Andronico explains, the Aegis of Aptos knitting group recently made 50 hats for Jacob’s Heart Children’s Cancer Support Services. These knit caps go straight to children with cancer who have or may soon lose their hair due to chemotherapy. The group has been meeting for several years, and this is not the first time the club has involved itself in the Aptos neighborhood and taken the initiative to give back to others. Resident Lois Hanneman, a retired nurse who celebrated her 99th birthday on Feb. 4, 2015, is the anchor of this club and invites friends and family of seniors – or anyone interested – to join in on the fun. For example, Aptos local Diane, the daughter of a former resident, is also an avid knitter and joins the group regularly. Though her mother has since passed away, Diane remains an active member to this day. As many as a dozen people gather every Friday to put their hands to work, knitting for different causes for people in the area. In the past, these knitting seniors and other community members have contributed their knit creations to various organizations, including donating baby blankets to the Santa Cruz women’s shelter and blankets to the local cancer hospital. These products, like the knit caps, are beautifully crafted – colorful, warm and symbols of compassion from the hearts of Aegis Living seniors. Efforts such as this also benefit the seniors greatly. 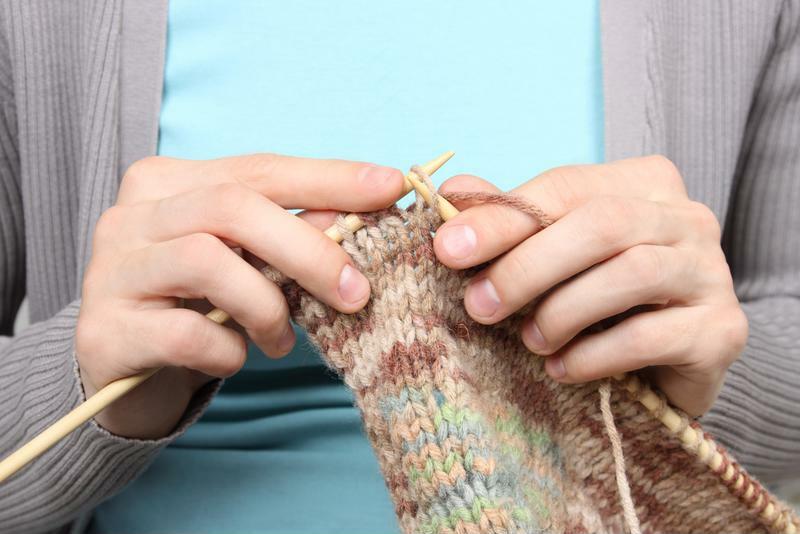 Lois has been knitting her whole life, and the club allows her to keep in touch with an old pastime. She’d be knitting up a storm no matter what as she says it keeps her hands busy while giving her a sense of accomplishment – and her love for the hobby is evident by the fact that many of her clothes are made by her own two hands. As she’s said to Andronico, “When you knit something, you put knit life into it.” But the club and its charity initiatives give her handmade items, as well as the time and care she puts into them, a whole new, deeper meaning. Using her skills to give back to the neighbors in her community provides a sense of accomplishment and of being valued, which is just as important in for seniors in their elder years as it was when they were young. Aegis Living also gives back to neighbors in their communities in other ways. The organization contributes to a wide variety of charities and not-for-profits dedicated to making the world a better place in general. The assisted living company dedicates financial resources to the Alzheimer’s Association to aid research toward a cure and new treatment options as well as initiatives that provide seniors and families affected by dementia. Aegis Living also donates to the American Diabetes Association, FareStart, the Eastside Domestic Violence Program and Rainier Scholars. Seniors at the other Aegis Living communities work together as well to bring comfort to people in need. For example, at Aegis on Madison, resident Margaret Hardin, who is 101, leads a blanket-making project that benefits Childhaven, a local not-for-profit that provides care and support to young children who have been neglected, abused and affected by drugs or alcohol. The blanket makers say they get more than they give. Working on the project makes them feel, “Like I’m helping somebody else,” Margaret says. Subscribe today to begin receiving helpful information on care and planning options. Copyright 2019 Aegis Living. | All Rights Reserved.